Strawberries are not just for dessert. They are also stunning in salads, lending sweet acidity to the peppery earthiness of greens. 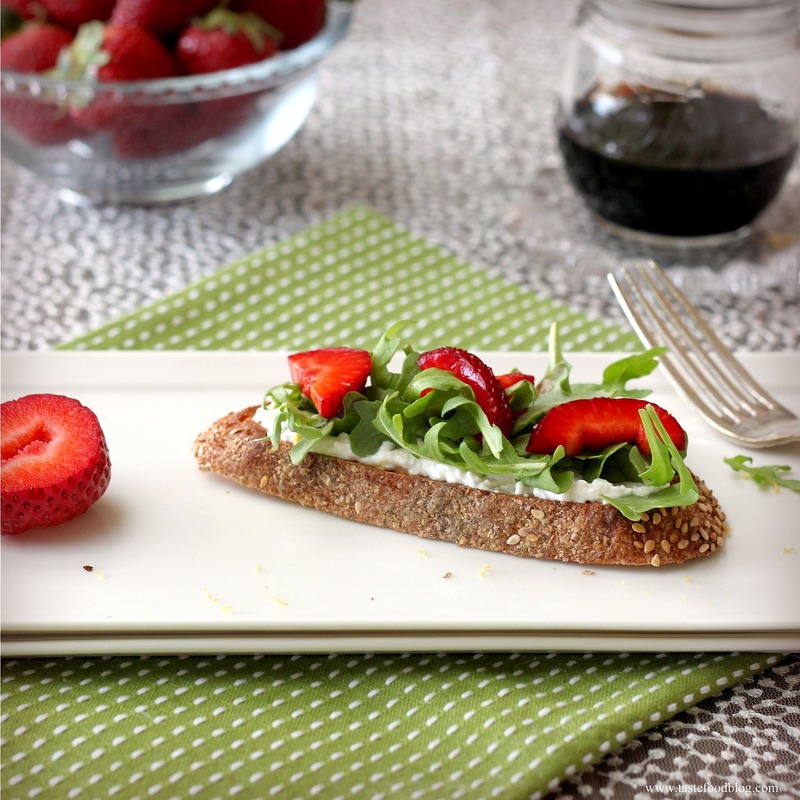 In this case, strawberries are jumbled with arugula as a topping for bruschetta. Creamy, lemon flecked ricotta anchors the salad to the bread, while a balsamic vinaigrette dresses the dish. Hello Spring! Be sure to use a fresh ricotta for this recipe. A creamy, mild goat cheese may be used in place of the ricotta. Makes 2. Toss the strawberries and balsamic vinegar together in a small bowl; set aside. Preheat oven broiler. Brush bread slices with olive oil. Sprinkle with a little salt. Broil in the oven until golden brown, turning once. Smear the ricotta over the bread slices. Sprinkle with lemon zest. Pile arugula on the bruschetta. 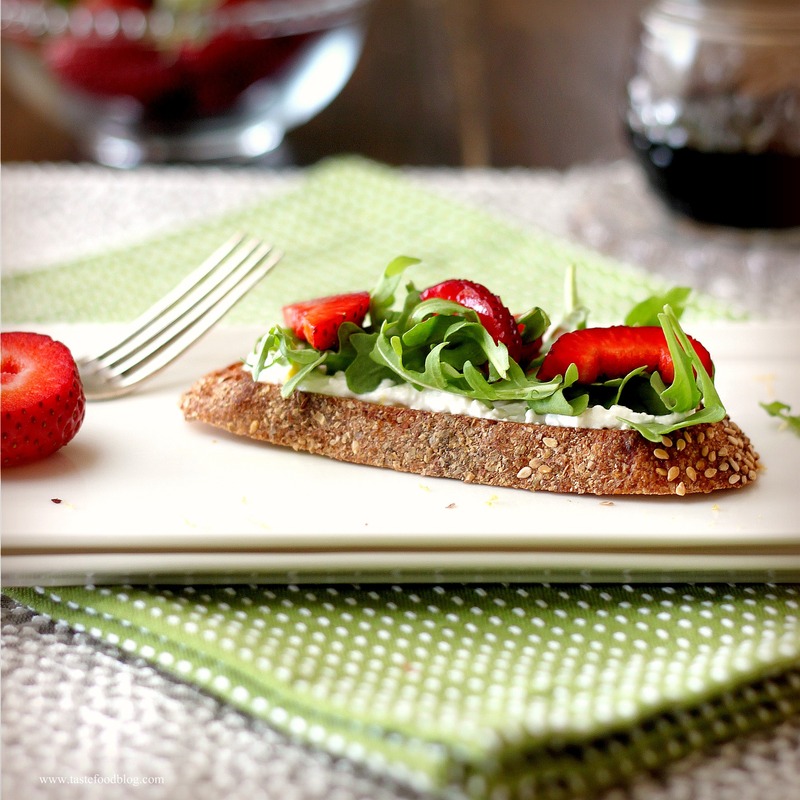 Remove the strawberries from the vinegar, shaking off excess liquid, and arrange over the arugula. Whisk 2 tablespoons of olive oil and a pinch of salt into the remaining vinegar. Drizzle over and around the bruschetta. Garnish with black pepper. I’m so glad to see a post on the savory possibilities of strawberries. I recently ate sushi at a place that included strawberry in many of its rolls. It was a lovely accent to the often mild fish. I hope you try it! Nice idea – we recently had a salad with chicken that included strawberries and had a citrus-y dressing. Your recipe reminds me to use them in savory dishes. It is SO strawberry season now. A salad with chicken and strawberries sounds lovely. Well I know what I want for lunch…. your colorful, flavorful and healthy bruschetta! Lovely photos too! Thanks for reminding me how much I love the sweet-savory taste of strawberry brucshetta. Your photos are gorgeous! Oh, I am in love. I really really like the colors in your photos! Get the latest post delivered to you free via email. Copyright © 2008 – 2019 This work by Lynda Balslev is licensed under a Creative Commons Attribution – Noncommercial – No Derivative Works 3.0 United States License. Permissions beyond the scope of this license may be available at tastefoodblog.com. Proudly powered by WordPress | Theme: Olsen by CSSIgniter.